Vinoth and Ajith were in talks after Sathuranga Vettai for a project which didn’t go on floors for unknown reasons. Tamil top star Ajith Kumar is currently gearing up to begin the shooting for his next film titled Viswasam which will be directed by Siva, who earlier made Vivegam and Vedalam with the actor. The film is said to go on floors in March and will be produced by Satya Jyothi Films, who produced Ajith’s previous release Vivegam. While all this is happening, reports are doing rounds regarding Ajith’s next film after Viswasam, which is being referred to as #Thala59. 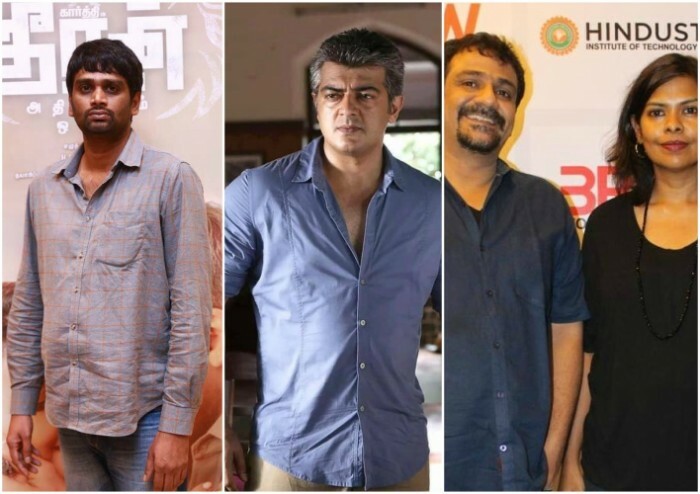 According to a leading Tamil tabloid, Theeran Adhigaaram Ondru director H.Vinoth is in talks with Ajith for his next and may be roped in to direct the film. The report also indicates that Vinoth has been in talks with Ajith regarding the script for a while now and in the latest meeting, Ajith has given his nod for the film. Vinoth and Ajith were in talks for a film since after Sathuranga Vettai which didn’t go on floors for unknown reasons. But post the release of Theeran Adhigaram Ondru, Ajith gave his nod to the director. However, contrary to these reports, news also has it that Ajith may team up with Vikram Vedha director duo Pushkar-Gayatri and have already narrated a script to Ajith. Emerging reports indicate that Ajith may give a go ahead to Pushkar-Gayatri for the 59th film of his career. These reports have created eagerness amongst fans of Ajith regarding Thala 59 and are waiting for a confirmation from the makers. Ajith will be soon sporting a salt n pepper look in Viswasam, again, going by the photos of the actor that have been doing rounds on social media. Director Siva had said that genre of Viswasam will be nothing like what they have done before and will be a totally new concept. Siva also added that Viswasam will bring out a new Ajith to the audience and will be loved more.